There was a time not so long ago that when you said super-bike, Harley-Davidson is what came to mind. This bike is a tribute to those times when HD ran supreme on the race tracks and the cafe race bikes of the 50's and 60's. This bike is not just another pretty face in the crowd. No matter where the V-TWIN Café goes, it draws a crowd. No fancy covers, no "Live to Ride" chrome. This bike was designed to be very functional on the street and the race track. Drag racing, land speed racing, a quick dash down a winding country road, cruising on Main Street in Daytona or just sitting down at the local watering hole are all on the menu for this motorcycle. When you want to make serious power with an engine on the street you need to accurately control the fuel that goes into the engine. The only way to provide fine control across the entire RPM range is with fuel injection. When I went looking for a suitable EFI system for this engine, there were no suitable systems. 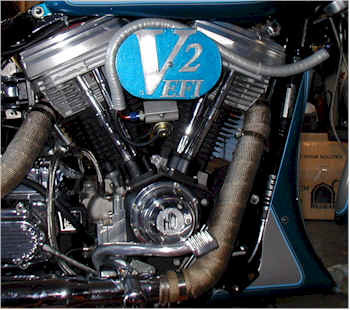 The only solutions was to build a performance EFI throttle body and ECU for my Harley-Davidson. The result was the MAD-EFI system that is now available for EVO, Twin Cam and XL engines from Taylor Marine. With a massive throttle plate measuring 2.750" by 2.125", the intake manifold and ECU used with this EFI is capable of supporting in excess of 200 horsepower in a normally aspirated engine. When creating a performance part we took the approach of "take no prisoners". 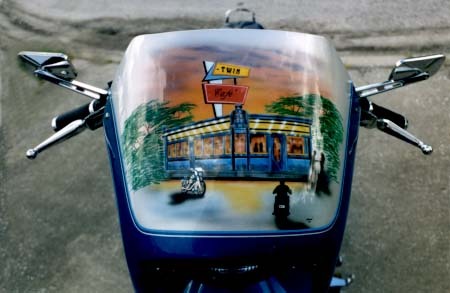 The bike was featured on the Born To Ride TV show aired on September 21, 2003. Click hear to see the video. 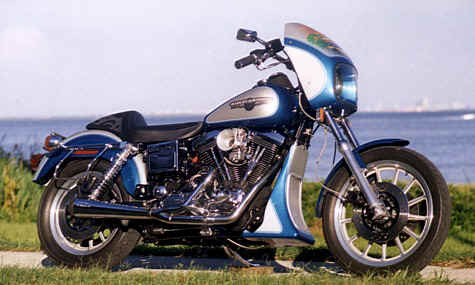 The bike was featured in the April 1997 issue of Thunder Alley magazine under the banner Torque-Tweaked DYNA . Time to Build: Who said it was finished?